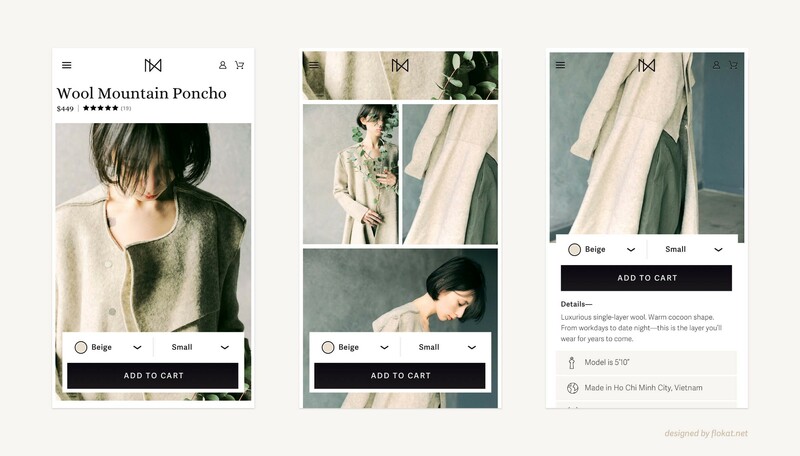 Instead of creating a bouquet of delicate solutions and delightful details, this high stakes mentality is making product pages across the world stagnant and stuffy. Sameness is boring. Success breeds fear. Fear stunts exploration. And without exploration, robots are going to take over our jobs. 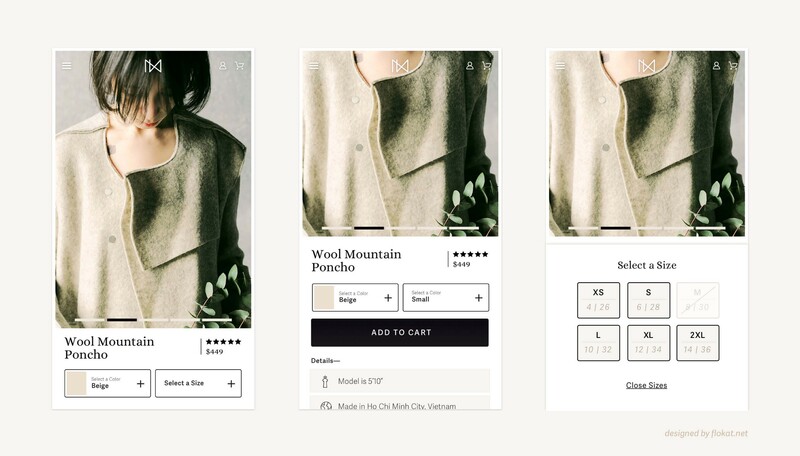 Below are 7 product page explorations that attempt to break the monotony of the product page, while respecting the non-negotiable reality that UX is king. 1. Why push the product page forward? According to Anthony Brebio at AB Tasty, your customers’ conversion from homepage to product page is only about 2–2.5%, but when they land directly on a product page, that conversion rate jumps to 7%. This is great news for mobile sites! Think about it. 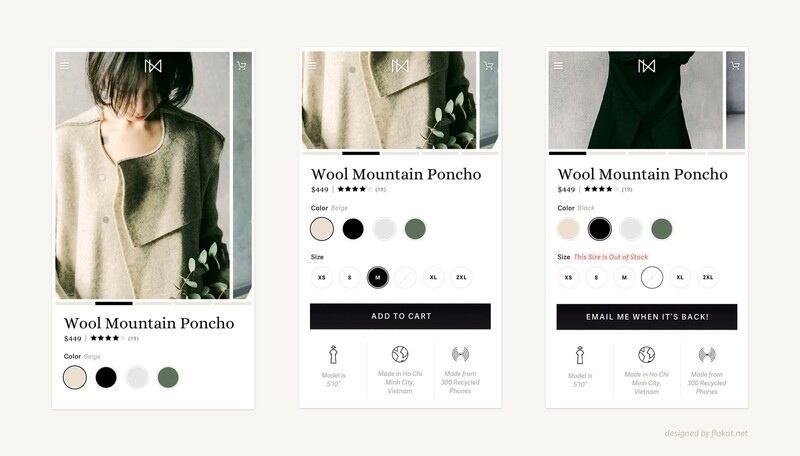 The ad you run on Instagram for a Wool Mountain Poncho can lead your customer directly from the poncho image in their feed to the poncho product page. It’s a match made in heaven. 2. Why are all these explorations only for mobile? In eCommerce, we see these mobile usage numbers trending even higher with 64–87% of our customers coming from mobile devices. For the sake of this design exploration, I’ve chosen to explore a fairly straight forward fashion product with two sets of variants. This is a ‘one foot in reality, one foot outside’ kind of experiment. These explorations will not contain every bit and bobble. Here I work to defy the patterns I so regularly fall into when designing product pages for mobile. 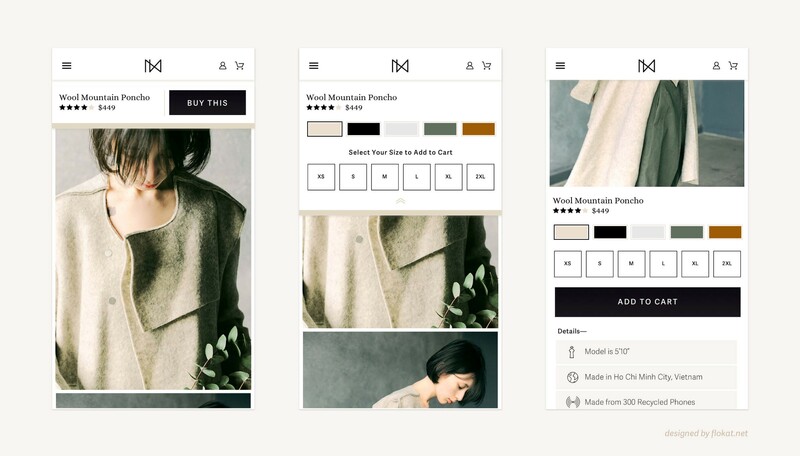 Each exploration attempts to push the visual layout of the top of a product pages, without jeopardizing the actions a user must take in order to purchase. This design was a necessary brain un-blocker. Here is the standard layout of nearly every apparel product page in existence. It’s smart, it’s reliable, it’s expected…but it’s not why you are reading this article. I will admit, this ‘sticky’ Add to Cart, or ecomm’s version of a Floating Action Button (FAB), is not new; but I’ve made some improvements. I made sure to add at least 50px padding below the button to stop the mobile browsers from thinking a user is trying to access the browser’s toolbar. These leads to double tapping in order to get Add to Cart to work. The second battle being fought here is a neurological trick of the eye. Even thought the Add to Cart is always there, it’s sometimes impossible to see! Remember the video with the dancing bear? When you are focused on looking at product images, you cannot see the Add to Cart button, which creates the ultimate blocker for conversion. In this solution, the floating Add to Cart will hook to the final image on the page and become inline with the other page content. This should catch any issues caused by brain tricks. A simple attempt to associate the color variants more closely with the product images. 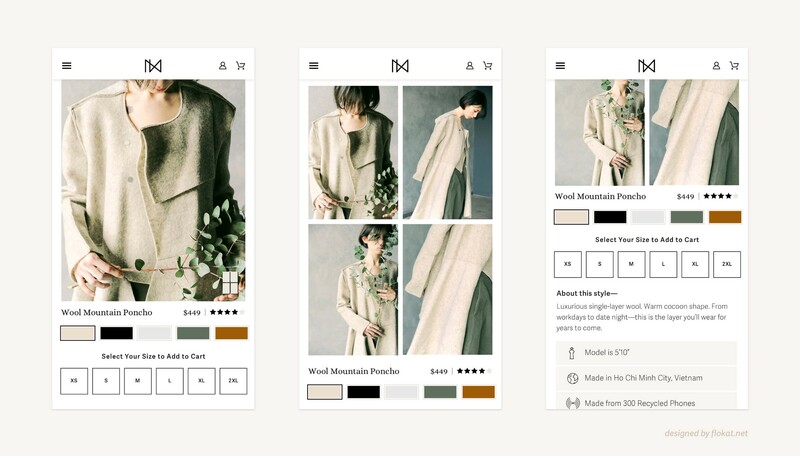 When the customer chooses to view a new color, 100% of the product image remains in view. I’ve also added a little more context to the S, M, L sizes by pairing US and EU measurements. Sometimes our variants are so complex they push our Add to Cart much further down the page than comfort allows. By using flyout drawers or overlays for variants, we create space and focus for the customer. This might be useful if I offer Classic colors, Seasonal colors and Neon colors of the same item. 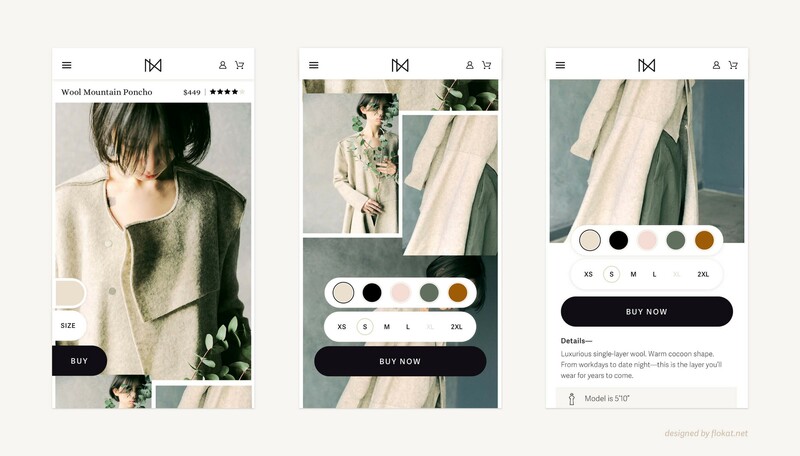 Rather than overwhelming the user with choices when they first enter the page, we can engage them once the tell us they’re interested, and additionally will have the space to break up the colors into 3 sections for Classic, Seasonal and Neon. 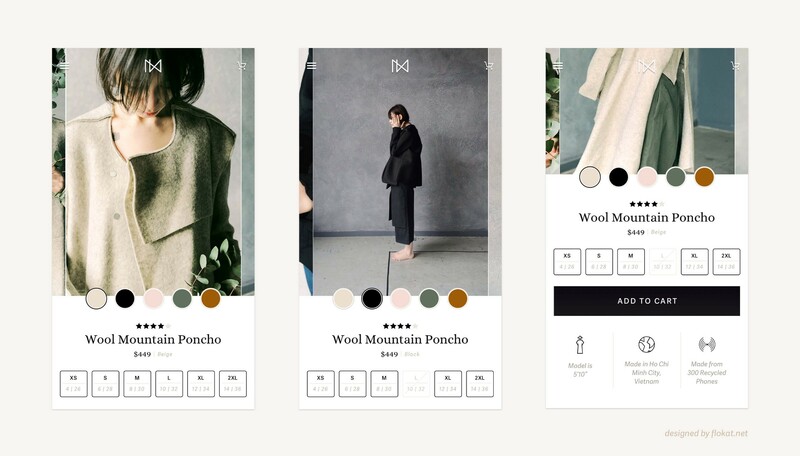 Here product images are displayed in a grid that can expand into full-width images when tapped. I also started thinking…why do we load our product pages at the very top? Why not load in the page about 50px down so that most of the image is shown, but more of the product variant selections are exposed. By removing the ‘Add to Cart’ button and making size selection add directly to cart, I’ve managed to pull all the variants, product images and actions above the fold. Who knew it could be done. In ‘The Floater — Product Detail Page Exploration 2.0' I explore a sticky add to cart at the bottom of the screen. What if we bring this up to the top? I maintain that sticky items sometimes get lost to the eye, so the variant and Add to Cart action should be a repeated element below the product images for customers who choose not to engage with the sticky top of the page. Let me know what challenges you face when building your product pages. I will try to address them in an in depth article about the anatomy of a Product Page. All the bits-and-bobbles will be thoroughly explored.